Extra Bet Roulette is a newer, but almost identical version of Coral and Ladbrokes Key Bet Roulette, with a few minor, and mostly unnoticeable differences. 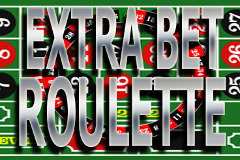 Extra Bet Roulette can be played in High Street bookies William Hill and Betfred and offers a progressive cashpot along with a standard European style roulette wheel layout. The main draw for players to Extra Bet Roulette is the progressive pot, and the value at which the pot may be at at any given time. Although there are professionals who target these games and Key Bets looking for high pots, the majority of players are locals looking for something that may offer higher returns than a standard roulette game. The progressive nature of the pot bonus will cause the roulette game to at times, be in the players' favour, which is very rare for any bonus roulette game, and the current only exceptions are Key Bet Roulette and the old classic, Lucky 8. You can also further increase your odds by playing at certain times, with William Hill's happy hour, often in the early evenings, offering the game to be played at a minimum of £1 per spin rather than the usual £5 minimum bet. For more details on when your bookie offers the happy hour and what games are involved, you will need to ask at their change desk as the games line-up does change on occasion. The Extra Bet roulette wheel is made up of the numbers zero to 36, with the additional placing of the Extra Bet bonus position nestled directly opposite zero, between the numbers 5 and 10. The odds on landing on the bonus position are exactly the same as landing on any other number on the roulette wheel; 38/1. The bonus wheel is then made up of a series of cash values between £20 and £70, plus the progressive pot. The value is randomly decided at the start of the game, prior to the ball spinning, and should that game then land in the Extra Bet bonus position, the selected value will be paid. If you are playing during the happy hour period offered by William Hill at certain times of the day, the minimum bet will be just £1. As you should only be playing this game for the bonus feature, then the optimum playing strategy here would be to place £1 on the Extra Bet position and press start, so although incredibly boring, you will be in effect treating the roulette game as a slot machine been played at £1 a go, with just one feature; Extra Bet. If you are playing at non-happy hour times, then the minimum bet will be £5 per spin, which can make for a costly playing experience if your luck isn't in. Assuming you are playing for the progressive pot, then the best playing strategy here would be the £1 minimum on the Extra Bet position, with the remainder £4 spread across your favourite numbers, but so they give a return of at least £5 when they hit. As the roulette game is random, where you place the remaining £4 is insignificant, but 'winning' a return of less than the bet is counter-productive, so you should bet to get your money back or a profit, with the main aim of hitting the Extra Bet position as soon as possible to result in the largest profit. Play only for the pot bonus, anything less then you may as well play 20p Roulette as the odds are slightly better. Try and play during 'happy hour' which is usually between 7pm and 10pm. This will allow you to play for only £1 per spin. If you are not playing during happy hour and are forced to bet a minimum of £5, spread your bet so the winning numbers you cover will award more than or the same as the £5 you wagered. Aim to take on Extra Bet Roulette with pots of at least £220, and then be patient and don't deviate from the goal of hitting the pot. As the game is random and the odds are long on hitting the progressive pot, you need to play a long game; patience is the key.